After a pleasant day wandering around New Orleans and making a substantial donation to Harrah's Casino I took a taxi to the airport. It's a fixed fare of about $33 plus tip. I had been monitoring Flight Stats during the day because bad weather in Chicago had delayed or cancelled many flights. I was slightly stressed I would miss my connection and I was starting to regret my decision about flying the long way via Chicago rather than through Dallas. As I arrived at the terminal I found the flight was still scheduled on time, although the Miami flight had been cancelled and those passengers would be stuck in New Orleans overnight. Chicago flights delayed - except for mine! There are no American Airlines lounges in New Orleans so I wandered around the terminal for a while before taking a seat in the gate area. At some point, not long before scheduled departure time an announcement was made that boarding would be delayed as Air Traffic Control would not give us a departure slot just yet due to heavy traffic at Chicago due to weather. The delay was expected to be about 45 minutes. That should be just enough time to make my connection still. By the time we eventually boarded it was closer to an hours delay and I was starting to stress that I was going to be stuck in Chicago overnight but it was out of my hands, so after takeoff I had a few vodkas to try and relax! Dinner was a chicken parmiagana, it wasn't the most visually appealling meal but it tasted quite ok! Certainly was enough food for this short 1.5 hour flight. We managed to make up a little bit of time en route and the Captain kept us regularly updated with our arrival time into Chicago - it seemed I was going to just make it to my next flight. We parked virtually right next door to my next flight which was handy, but I needn't have worried. The Las Vegas flight was delayed by about 40 minutes anyway! Finally it was time to board, so on I went with the other First Class passengers. 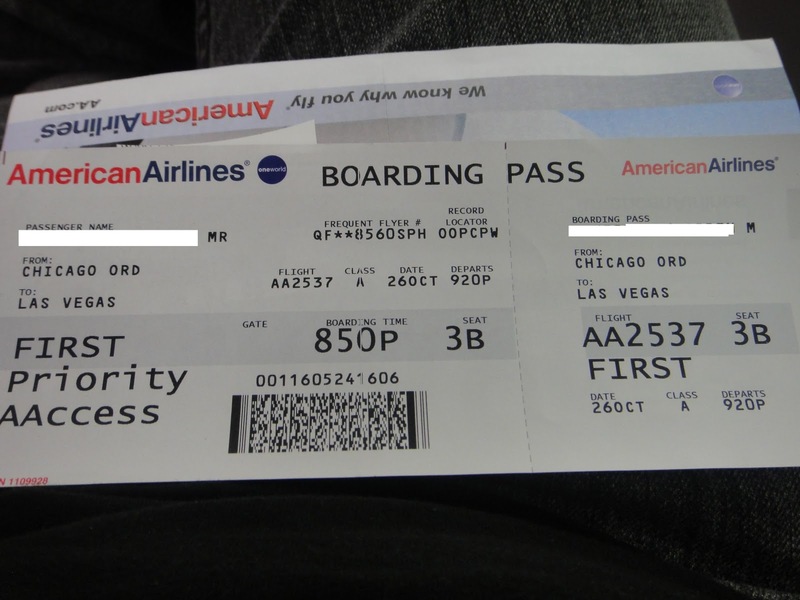 After several AA flights I was not surprised to see that there was no flight attendant welcoming us at the door. Seems pretty normal for AA! The Chicago based purser was a rather senior lady who seemed very quirky! Her behaviour just didn't seem quite normal to me, although her service was very good. During the taxi out for takeoff she had quite a serious argument with the other flight attendant seated in the front jumpseats. For some reason the flight attendant and purser did not agree on who should complete a certain task and they loudly argued the point with eachother. Everyone in first class looked quite shocked! They seemed to settle down after a few minutes though. The cabin crew would be performing an all night shift with the flight to Las Vegas and then the red eye back to Chicago, getting back at about 6 in the morning. Being a late night flight there was only a refreshment service initially, and later in the flight fresh baked cookies were offered. I settled in and set up my laptop to watch one of my favourite comedies, 'The Inbetweeners'. The remainder of the flight was routine and we made a smooth approach and landing in Las Vegas, arriving around midnight. The terminal was pretty empty at that time! For my one night stay I would be staying at the Las Vegas Hilton. I have stayed at this property before and I think it's great for the money and is conveniently connected to the strip by 24 hour monorail service. It's a nice way to earn frequent flyer points too, with rooms as cheap as about $50 a night regularly available. I had a great day in Las Vegas but sadly, I did not win any money in the casino's. Oh well, there is always next time. Next up is the flight to Bangkok via Los Angeles with American Airlines and Thai Airways. Stay tuned!